Gov. Imee Marcos jokes about Senator Juan Ponce Enrile and Bongbong Marcos’ joblessness as the reason for their utmost support to her in the Congress conflict. However, it is far more than that. As the late President Ferdinand E. Marcos’ 100th birth anniversary is nearing, the re-merger actually confirms Enrile’s disclosure that he can never turn his back to the Marcoses. 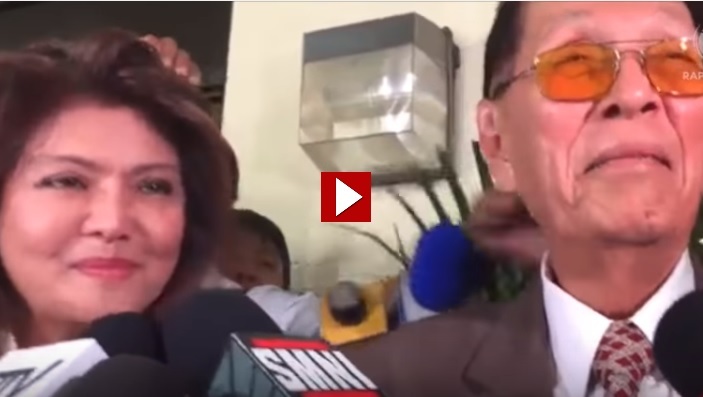 [VIDEO]: Ilocos Norte Governor Imee Marcos thanks, ex-Senate President Juan Ponce Enrile for helping her testify in a House probe into alleged misuse of local tobacco funds. Gov. Marcos said that the next hearing for the Ilocos 6 is on August 9. Enrile voluntarily said that he will join her again. This is after she thanked him for the vital support that leads to the freedom of the detained Ilocos Norte officials at the Congress. Enrile always sticks to his story that he remained loyal to the late President Marcos during the EDSA event. He can’t even call it a revolution but a mere mutiny. It just got out of hand when former President Fidel Ramos and the church people dragged their patrons to the streets. Liberal Party politicians call this a revision of history. However, Enrile is the living proof that he is determined to expose the truth to this date. Contrary to the claims of Satur Ocampo and Albay Representative Edcel Lagman that Marcos burial at the LNMB last November 18 was a “gross distortion, a malevolent revision and a wanton derogation of Philippine history,” EDSA cannot discredit the strongman. Its mastermind is still alive to tell the real story repeatedly. Enrile is always pro-Marcos. EDSA saved the Marcoses who in return, saved the people as well. Governor Marcos respects the opposition but “we also have the right to talk,” she stressed. “I am hoping that before his 100th birthday the Supreme Court will finally resolve the matter. Remember we will only come to bury Ceasar, not to praise him,” she added.